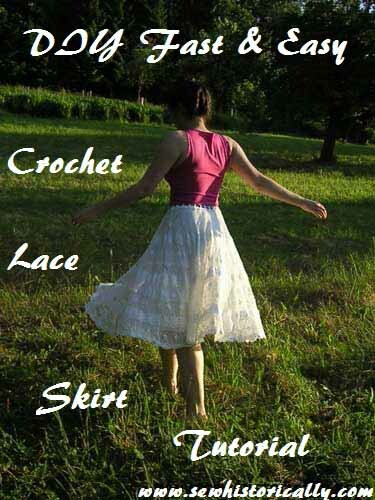 In this tutorial I’ll show you how to make a quick and easy crochet lace summer skirt without crocheting it yourself! 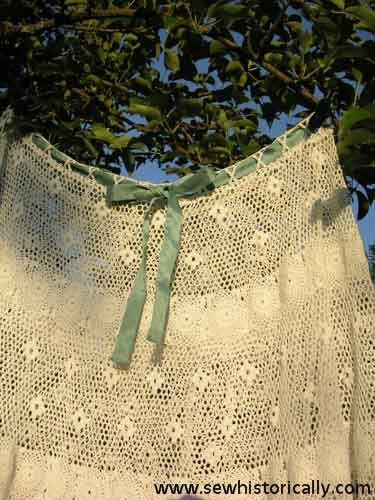 You can use a round crochet lace tablecloth – like I did – or a square one, then the hem will be uneven. 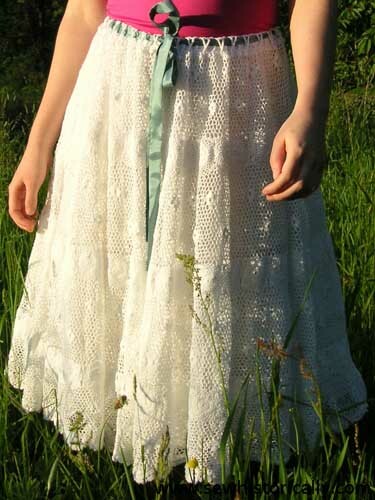 You’ll need a tablecloth with a diameter of 60″/ 150cm for a knee-length skirt. Waist: Measure round your waist or hip, depending on where you want to wear the skirt. 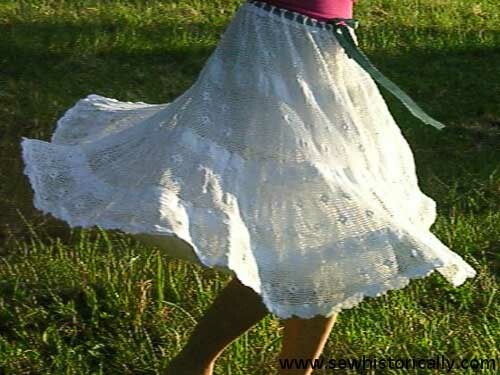 If you want to make the skirt without a closure, add some extra width to your waist measurement, so you can easily put on the lace skirt. r: r = waist/2π. π ≈ 3,14. Example: If your waist measurement is 90cm, then r = 90/2π = 45/π ≈ 14. Fold the crochet lace tablecloth twice and mark the center. Use a measuring tape and draw a circle with your calculated radius (in the example the radius would be 14cm). Now cut out the circle. 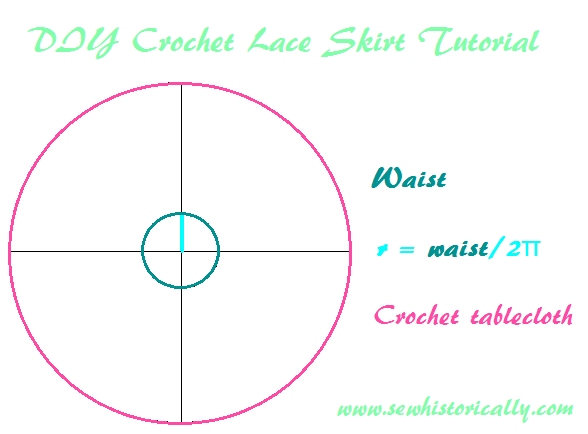 Tip: Some crochet lace stretches more, some less. So better cut a smaller circle at first, then try on the skirt if it fits. Adjust the circle if necessary. 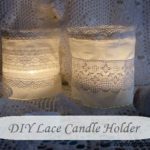 Don’t throw away the cut out circle, you can always use the lace for something else. 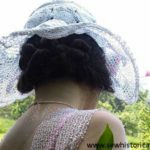 I used it to make a crochet lace hat. 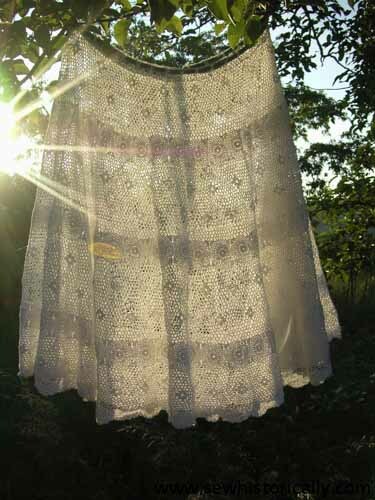 I zigzagged round the cut out circle with the sewing machine to prevent the lace from fraying, but the lace hardly frayed at all. 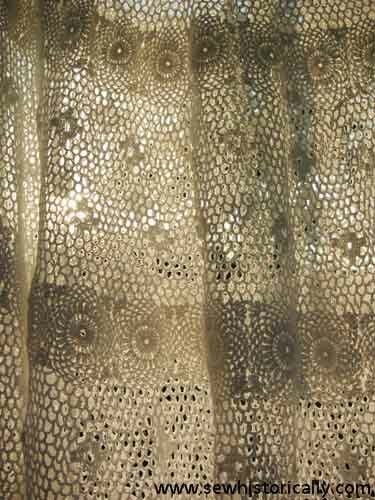 Option 1: Just leave the cut edge unfinished (if the lace doesn’t fray badly) and thread a drawstings through the holes of the lace. Option 2: Finish the waist with an elastic waistband. 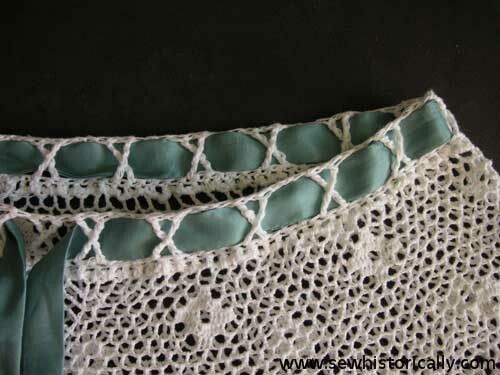 Option 3 (which I did): Use a crochet thread of similar color and thickness and crochet a waistband casing around the cut edge. 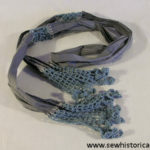 You can thread the crochet waistband with elastic or ribbon. I used leftover scraps from my 1920s mint green cellulose acetate dress for a fabric belt. 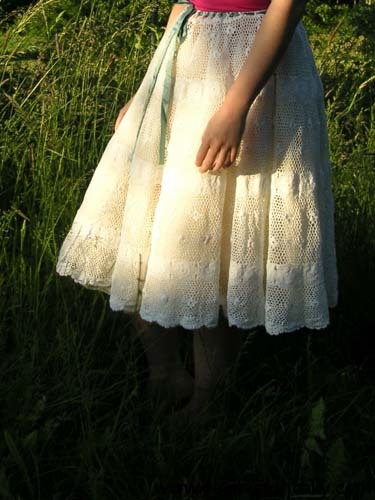 In some of the pictures I’m wearing the crochet lace skirt over a white cotton crepe skirt and in some pictures, where the crochet skirt is more puffy, I’m wearing it over a cream-colored tulle skirt. I love this idea 😉 Thank you for sharing @Vintage Charm! Thank you! 🙂 I love my skirt: it’s so summerly. 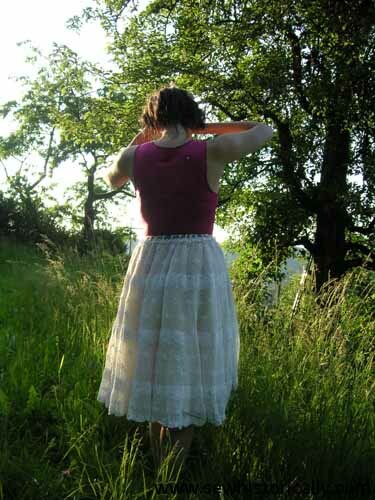 And it’s so easy to refashion a tablecloth into a skirt. Lina, This is simply gorgeous! Wanted to let know that you will be one of my features today on Snickerdoodle Link Party! Thanks so much for sharing your awesome projects with us!